So, you got a letter. Take a deep breath... and give us a call. First, realize that a letter is often just a request for more information. Somehow what the IRS (or state), has in their computer does not match up with what they expected. Many times, the resolution is a simple act of sending more information, or copies of supporting documents (like W2s, mileage logs or receipts). If the audit involves a return we prepared, just fax/email us a copy of the letter. We will pull up your file and assess the situation. If it is a routine letter, we can send the necessary documentation off and all is done. Remember, we defend any audit as part of our guarantee. Before you call or send anything off to a government office, talk to us first! Sometimes there is wisdom to be had with our experience. If the return in question was not prepared by us, we will have a quick chat with you, and tell you what documents we need to assess the situation. After we review your paperwork, we can discuss terms should you decide to utilize our services. Many times we take cases on a contingency basis, where our fees are only a portion of what we saved you. WHAT WE ARE NOT: is a company that makes guaranteed of settlements of 'pennies to the dollar.' Believe it or not, if we cannot help, we will be honest, and tell you your options. As a last note, audits are not required to be defended locally. Even though we are in South Carolina, and you may be in St. Thomas, USVI, it makes no difference. Ninety-nine percent of all audits can be resolved over phone/fax/mail/email; person-to-person meetings are not usually required. 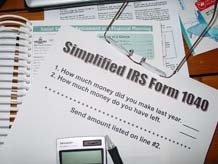 Step 1 - Contact us, NOT the IRS or the state. Fax/email/mail us a copy of the notice and then call the office. We will schedule you for an appointment. Remember, there is no charge for this step, even if you are not already a client. Occasionally our clients tried to resolve the issue themselves instead of "bothering us." In that process they unintentionally let something slip, be it use a phrase, or making a statement, that set alarms bells off! And now what had been a simple request for more information, has become a full-fleged audit! If you were not a client at the time and it is a simple resolution we do not need to get involved, we will let you know what to do and how to do it. If there is no point in contesting the reassessment, we will be honest with you, so you can at least not also incur charges for work that will give you no benefit. But we are good at what we do, and since we specialize in travelers, we have records of court cases regarding reimbursements, tax homes, etc. These we use to defend your return. If we think you have a defendable case, we will go over what you can expect in service fees. Step 2 - Engage our services and sign paperwork. Should you decide to utilize our services, we will send you an IRS/state POA (power of attorney) for the year(s) involved and an engagement letter. An engagement letter is not a marriage proposal, but a contract that allows us to represent you. The POA will be limited to cover your tax issues. Before anything else can be done, these will need to be signed and returned. Generally, at this point we will also require a $250 retainer for our services, unless it involves a return we prepared and there were no missing documents with the original submissions. This is the only amount of money we require until closure of the case. Step 3 - Wait until the POA has been processed. Yes, we are all in the first of many waiting periods. This one can take a couple of weeks. Step 4 - " General correspondence " gets exchanged. This is the stage where we contact your auditor to discuss the situation. It is similar to initial statements in a hearing. Each side presents their position and why they are taking their stand. Only after this meeting will we have a better feel for what you can expect and what records he/she will need from you. Depending on your auditor ’s schedule, it may take a several weeks to get this appointment. Step 5 - We will update you on your situation and notify if there is additional information to gather. This is where you go to work. You will be given a list of what receipts, contracts, leases, etc. we need to substantiate the deductions on your return. Now we wait on you. As soon as you get these items to us, we can begin to prepare our/your defense. Step 6 - We submit documentation to the IRS/state agency and wait. This may look like it is the last stage, but it really is more of a final series. Without knowing the particulars of your situation, we cannot give any outline to this step. The IRS and state agencies have their own procedures and regulations and cases can get reassigned. There is usually nothing that can be done to speed up the process. It is governmental regulation in its worst form. We are very familiar with this and even though it will seem at times that nothing is being done, we are keeping tabs on the situation. Possibility 1) It may be a simple document exchange and the case can be resolved in 30 days. Possibility 2) It may be a complicated process of 60 day letters, 90 day waits, auditors going back and forth to their supervisors, maybe even passing a judgment at the lower level that then needs to go to appeals... Occasionally, an audit can go on as long as 2 years before final resolution. Step 7 - We bill you. You don't pay us until it is resolved. Also by this time, you will have had an idea of what to expect, so it should not be a shock. Since much of the time our bill is based on a relatively low recovery percentage, the bill will be much lower than what you would have paid the IRS/state had we not defended your return. Even though you may feel like this is true, it really isn't. There is a light at the end of the tunnel... it just feels like it is far, far away.